Nuttall, V.W.. "Radish". The Canadian Encyclopedia, 04 March 2015, Historica Canada. https://www.thecanadianencyclopedia.ca/en/article/radish. Accessed 18 April 2019. Radish (Raphanus sativus) is a hardy annual or biennial vegetable belonging to the Cruciferae family. Roots are mostly rounded with a red exterior and white, acrid flesh. European radishes. 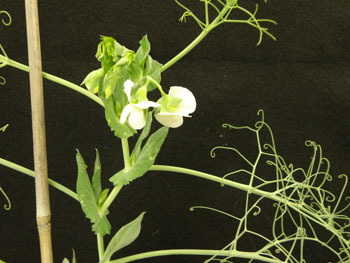 Planted in spring or summer, they have a short cultivation time of 3-4 weeks (courtesy Isis Gagnon-Grenier). Radish (Raphanus sativus) is a hardy annual or biennial vegetable belonging to the Cruciferae family. Roots are mostly rounded with a red exterior and white, acrid flesh. 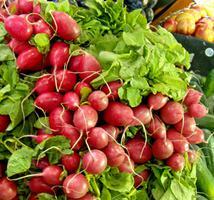 Originating in Eurasia, radishes were prized by the Egyptians and Greeks. Commercial varieties now include Red Prince, Champion, French Breakfast and White Icicle. Radishes are a cool-season, fast-germinating crop. Outdoors, they require 25-35 days from seeding to table; winter types, 50-60 days. Radishes tolerate light frosts and are seeded 1 cm deep as soon as soils are workable in spring; precision seeders provide accurate spacing for commercial crops. With skilful management and cool, moist soils, seeding every 10-14 days provides radishes from April to September (early November in Southwestern Ontario). Growth checks by heat or drought result in inedible, hot, tough roots. Flea beetles, cabbage-root maggots and damping-off require control. Appreciated for their crisp texture and mild, tangy flavour, radishes are high in potassium and a good source of vitamins A and C. Canada produces approximately 13 000 t (on about 1000 ha) of radishes annually, a crop valued at more than $10 million. The main producers are Québec, Ontario and British Columbia.